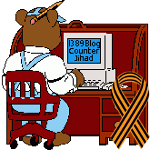 How Vladimir Putin cleaned up corruption in Russia — 1389 Blog - Counterjihad! Is a content-filtering service blacklisting your website? As the Ukraine situation has worsened, unconscionable misinformation and hype is being poured on Russia and Vladimir Putin. Journalists and pundits must scour Internet and thesauruses to come up with fiendish new epithets to describe both. Putin obviously has his faults and makes mistakes. Based on my earlier experience with him, and the experiences of trusted people, including U.S. officials who have worked closely with him over a period of years, Putin most likely is a straight, reliable and exceptionally inventive man––a leader who quietly labors under mounds of accusations and myths that have been steadily leveled at and about him since he became Russia’s second president. I’ve stood by silently watching the demonization of Putin grow since it began in the early 2000s –– I pondered on computer my thoughts and concerns, hoping eventually to include them in a book (which was published in 2011). The book explains my observations more thoroughly than this article. Like others who have had direct experience with this formerly unknown man, I’ve tried to avoid being labeled as a “Putin apologist”––but to no avail. If one is even neutral about this Russian leader, they are considered “soft on Putin” by pundits, news hounds and average citizens who get their news from CNN, Fox and MSNBC. I don’t pretend to be an expert, just a program developer in the USSR and Russia for the past 30 years. But during this time, I’ve have had far more direct, on ground contact with Russians of all stripes across 11 time zones than any of the Western reporters or for that matter any of Washington’s officials. I’ve been in country long enough to ponder Russian history and culture deeply, to study their psychology and conditioning, and to understand the marked differences between American and Russian mentalities which so complicate our political relations with their leaders. As with personalities in a family or a civic club or in a city hall, it takes understanding and compromise to be able to create workable relationships when basic conditionings are different. Washington has been notoriously disinterested in understanding these differences and attempting to meet Russia halfway. In addition to my personal experience with Putin, I’ve had discussions with numerous American officials and U.S. businessmen who have had years of experience working with him––I believe it is safe to say that none would describe him as “brutal” or “thuggish”, or the other slanderous adjectives and nouns that are repeatedly used in western media. I met Putin years before he ever dreamed of being president of Russia, as did many of us working in St.Petersburg during the 1990s. Since all of the slander started, I’ve become nearly obsessed with understanding his character. I think I’ve read every major speech he has given (including the full texts of his annual hours-long telephone “talk-ins” with Russian citizens). I’ve been trying to ascertain whether he has changed for the worse since being elevated to the presidency, or whether he is a straight character cast into a role he never anticipated––and is using sheer wits to try to do the best he can to deal with Washington under extremely difficult circumstances. If the latter is the case, and I think it is, he should get high marks for his performance over the past 14 years. Putin is obviously a long-term thinker and planner and has proven to be an excellent analyst and strategist. It’s not by accident that Forbes declared him the most Powerful Leader of 2013, replacing Obama who was given the title for 2012. The following is my one personal experience with Putin. The year was 1992: It was two years after the implosion of communism; the place was St.Petersburg. For years I had been creating programs to open up relations between the two countries and hopefully to help Soviet people to get beyond their entrenched top-down mentalities. A new program possibility emerged in my head. Since I expected it might require a signature from the Marienskii City Hall, an appointment was made. My friend Volodya Shestakov and I showed up at a side door entrance to the Marienskii building. We found ourselves in a small, dull brown office, facing a rather trim nondescript man in a brown suit. He inquired my reason for coming in. After scanning the proposal I provided he began asking intelligent questions. After each of my answers, he asked the next relevant question. I became aware that this interviewer was different from other Soviet bureaucrats who always seemed to fall into chummy conversations with foreigners in hopes of obtaining bribes in exchange for their requests. CCI stood on the principle that we would never, never give bribes. This bureaucrat was open, inquiring, and impersonal in demeanor. After more than an hour of careful questions and answers, he quietly explained that he had tried hard to determine if the proposal was legal, then said that unfortunately at the time it was not. A few good words about the proposal were uttered. That was all. He simply and kindly showed us to the door. Out on the sidewalk, I said to my colleague, “Volodya, this is the first time we have ever dealt with a Soviet bureaucrat who didn’t ask us for a trip to the US or something valuable!” I remember looking at his business card in the sunlight––it read Vladimir Vladimirovich Putin. 1994: U.S. Consul General Jack Gosnell put in an SOS call to me in St.Petersburg. He had 14 Congress members and the new American Ambassador to Russia, Thomas Pickering, coming to St.Petersburg in the next three days. He needed immediate help. I scurried over to the Consulate and learned that Jack intended me to brief this auspicious delegation and the incoming ambassador. I was stunned but he persisted. They were coming from Moscow and were furious about how U.S. funding was being wasted there. Jack wanted them to hear the”good news” about CCI’s programs that were showing fine results. In the next 24 hours Jack and I also set up “home” meetings in a dozen Russian entrepreneurs’ homes for the arriving dignitaries (the St.Petersburg State Department people were aghast, since it had never been done before––but Jack overruled). Only later in 2000, did I learn of Jack’s former three-year experience with Vladimir Putin in the 1990s while the latter was running the city for Mayor Sobchak. More on this further down. With no warning, at the turn of the year, President Boris Yeltsin made the announcement to the world that from the next day forward he was vacating his office and leaving Russia in the hands of an unknown Vladimir Putin. On hearing the news, I thought surely not the Putin I remembered––he could never lead Russia. The next day a NYT article included a photo. Yes, it was the same Putin I’d met years ago! I was shocked and dismayed, telling friends, “This is a disaster for Russia, I’ve spent time with this guy, he is too introverted and too intelligent––he will never be able to relate to Russia’s masses.” Further, I lamented: “For Russia to get up off of its knees, two things must happen: 1) The young oligarchs have to be removed by force from the Kremlin, and 2) A way must be found to remove the regional bosses (governors) from their fiefdoms across Russia’s 89 regions”. It was clear to me that the small man in the brown suit would never have the instincts or guts to tackle Russia’s overriding twin challenges. February 2000: Almost immediately Putin began putting Russia’s oligarchs on edge. In February a question about the oligarchs came up; he clarified with a question and his answer: “What should be the relationship with the so-called oligarchs? The same as anyone else. The same as the owner of a small bakery or a shoe repair shop.” This was the first signal that the tycoons would no longer be able to flaunt government regulations or count on special access in the Kremlin. It also made the West’s capitalists nervous. After all, these oligarchs were wealthy untouchable businessmen––good capitalists, never mind that they got their enterprises illegally and were putting their profits in offshore banks. Putin called a meeting with the oligarchs four months later and gave them his deal: They could keep their illegally-gained wealth-producing Soviet enterprises and they wouldn’t be nationalized …. as long as they paid taxes on their revenues and stayed out of politics. This was the first of Putin’s “elegant solutions” to the near impossible impossible challenges facing the new Russia. But the deal also put Putin in crosshairs with US media and officials who then began to champion the oligarchs, particularly Mikhail Khodorkovsky. The latter became highly political, didn’t pay taxes, and prior to being apprehended and jailed was in the process of selling a major portion of Russia’s largest private oil company, Yukos Oil, to Exxon Mobil. Unfortunately, Khodorkovsky became a martyr (and remains so up to today) with U.S. media and governing structures. March 2000: I arrived in St.Petersburg. A Russian friend (a psychologist) since 1983 came for our usual visit. My first question was, “Lena what do you think about your new president?” She laughed and retorted, “Volodya! I went to school with him!” She began to describe Putin as a quiet youngster, poor, fond of martial arts, who stood up for kids being bullied on the playgrounds. She remembered him as a patriotic youth who applied for the KGB prematurely after graduating secondary school (they sent him away and told him to get an education). He went to law school, later reapplied and was accepted. I must have grimaced at this, because Lena said, “Sharon in those days we all admired the KGB and believed that those who worked there were patriots and were keeping the country safe. We thought it was natural for Volodya to choose this career. My next question was, “What do you think he will do with Yeltsin’s criminals in the Kremlin?” Putting on her psychologist hat, she pondered and replied, “If left to his normal behaviors, he will watch them for a while to be sure what is going on, then he will throw up some flares to let them know that he is watching. If they don’t respond, he will address them personally, then if the behaviors don’t change–– some will be in prison in a couple of years.” I congratulated her via email when her predictions began to show up in real time. Late 2000: Into Putin’s first year as Russia’s president, US officials appeared to be suspect that he would be antithetical to America’s interests––his every move was called into question in American media. I couldn’t understand why and was chronicling these happenings in my computer and newsletters. Year 2001: Jack Gosnell (former USCG mentioned earlier) explained his relationship with Putin when the latter was deputy mayor of St.Petersburg. The two of them worked closely to create joint ventures and other ways to promote relations between the two countries. Jack related that Putin was always straight up, courteous and helpful. When Putin’s wife, Ludmilla, was in a severe auto accident, Jack took the liberty (before informing Putin) to arrange hospitalization and airline travel for her to get medical care in Finland. When Jack told Putin, he reported that the latter was overcome by his offer, but ended saying that he couldn’t accept this favor, that Ludmilla would have to recover in a Russian hospital. She did––although medical care in Russia was abominably bad in the 1990s. A senior CSIS officer I was friends with in the 2000s worked closely with Putin on a number of joint ventures during the 1990s. He reported that he never had any dealings with Putin that were questionable, that he respected him and believed he was getting an undeserved bad reputation from US media. Matter of fact, he closed the door at CSIS when we started talking about Putin. I guessed his comments wouldn’t be acceptable if others were listening. Another former U.S. official who will go unidentified, also reported working closely with Putin, saying there was never any hint of bribery, pressuring, nothing but respectable behaviors and helpfulness. From 2001 up to today, I’ve watched the negative U.S. media mounting against Putin …. even assassinations, poisonings, and comparing him to Hitler. No one has come up with any concrete evidence for these accusations. During this time, I’ve traveled throughout Russia every year, and have watched the country slowly change under Putin’s watch. Taxes were lowered, inflation lessened, and laws slowly put in place. Schools and hospitals began improving. Small businesses were growing, agriculture was showing improvement, and stores were becoming stocked with food. Alcohol challenges were less obvious, smoking was banned from buildings, and life expectancy began increasing. Highways were being laid across the country, new rails and modern trains appeared even in far out places, and the banking industry was becoming dependable. Russia was beginning to look like a decent country –– certainly not where Russians hoped it to be long term, but improving incrementally for the first time in their memories. My 2013/14 Trips to Russia: In addition to St.Petersburg and Moscow, in September I traveled out to the Ural Mountains, spent time in Ekaterinburg, Chelyabinsk and Perm. We traveled between cities via autos and rail––the fields and forests look healthy, small towns sport new paint and construction. Today’s Russians look like Americans (we get the same clothing from China). Old concrete Khrushchev block houses are giving way to new multi-story private residential complexes which are lovely. High-rise business centers, fine hotels and great restaurants are now common place––and ordinary Russians frequent these places. Two and three story private homes rim Russian cities. We visited new museums, municipal buildings and huge super markets. Streets are in good repair, highways are new and well marked now, service stations looks like those dotting American highways. In January I went to Novosibirsk out in Siberia where similar new architecture was noted. Streets were kept navigable with constant snowplowing, modern lighting kept the city bright all night, lots of new traffic lights (with seconds counting down to light change) have appeared. It is astounding to me how much progress Russia has made in the past 14 years since an unknown man with no experience walked into Russia’s presidency and took over a country that was flat on its belly. So why do our leaders and media demean and demonize Putin and Russia??? Like Lady MacBeth, do they protest too much? Psychologists tell us that people (and countries?) project off on others what they don’t want to face in themselves. Others carry our “shadow”when we refuse to see it. We confer on others the very traits that we are horrified to acknowledge in ourselves. Could this be why we constantly find fault with Putin and Russia? Could it be that we project on to Putin the sins of ourselves and our leaders? Could it be that we condemn Russia’s corruption, acting like the corruption within our corporate world doesn’t exist? Could it be that we condemn Russia’s human rights and LGBT issues, not facing the fact that we haven’t resolved our own? Could it be that we accuse Russia of “reconstituting the USSR”––because of what we do to remain the world’s “hegemon”? Could it be that we project nationalist behaviors on Russia, because that is what we have become and we don’t want to face it? Could it be that we project warmongering off on Russia, because of what we have done over the past several administrations? Some of you on this e-list were around Putin in the earlier years. Please share your opinions, pro and con …. confidentiality will be assured. It’s important to develop a composite picture of this demonized leader. I’m quite sure that 99% of those who excoriate him in mainstream media have had no personal contact with him at all. They write articles on hearsay, rumors and fabrication, or they read scripts others have written on tele-prompters. This is how our nation gets its “news”, such as it is. There is a well known code of ethics among us: Is it the Truth, Is it Fair, Does it build Friendship and Goodwill, and Will it be Beneficial for All Concerned? It seems to me that if our nation’s leaders would commit to using these four principles in international relations, the world would operate in a completely different manner, and human beings across this planet would live in better conditions than they do today. As always your comments will be appreciated. And yes, Vladimir Putin most certainly is a Christian. Here's how you can promote your book while helping 1389 Blog. Click for details! Please CLICK HERE and read before commenting! Please Imam Francis, tell us why it is that all of these students of Islam keep getting it so wrong! Sri Lanka Police Chief Was Warned! An Open Challenge to Jewish Columnist: Let’s Have a Debate! The admins, 1389 and CzechRebel, run this blog at our own expense. We work for a living, but thanks to the Obamaconomy, we are of severely limited means. We spend many hours per week of unpaid time maintaining the blog. If you find this blog worth reading, please contribute! Please use the Tip Jar button to donate via PayPal or credit card! How can you tell whether someone is a Muslim? Islam 101: What Is Islam? The Battle of Kosovo Was Fought in 1389 A.D.
VIDEO / Serbs in Chicago celebrating the Centennial of the End of WWI / Razglednica iz Amerike na "RTS" - 5 februar 2019 - Postcard from America on Radio-Television Serbia (RTS) February 5, 2019 / "Radio TV Avala Chicago-Serbian American Television"
Breakthrough on the Salonika Front by the Serbian First and Second Army September 1918 - A decisive victory against the Central Powers in WWI / 1918. године, после тродневне офанзиве, Прва и Друга армија српске војске пробиле су Солунски фронт. Тај моменат био је одлучујући за слом Централних сила у Првом светском рату. Sermons at St. Nicholas: If God is Love, Why Can’t I Live However I Want? Валерий Духанин: ЛЮБОВЬ ИЛИ НЕНАВИСТЬ? Валериј Духањин: Љубав или мржња?